There is a reason most lawns are open spaces. Most grasses prefer full sun and need between 4-6 hours of direct sun each day to thrive. If you think about wild grassy areas they are most successful in open spaces, woodland clearings and moorland where trees are not obscuring the light. A lawn in shade is not ideal for most grasses. Areas of dappled shade or which have full sun for part of the day can be accommodated by choosing the right grass seed variety for the conditions. If the area you want to cultivate is always in shade then it may be better to think about under-planting with something more likely to thrive. You will find lawn seed mix for shade, so if you really want to grow a lawn in a shaded area then choose a shade tolerant variety. Fescue grasses are better able to grow in shady areas so, make sure you read the packaging when you buy, and apply the right grass seed for the conditions you have around your new lawn. If your shaded lawn is caused by trees, you could also consider pruning large trees to increase sunlight for your lawn. Trees thrive better if you leave a 1 meter ‘grass free zone’ around their trunks, so you could introduce some mulch to improve moisture levels for the tree. That would in turn improve the moisture levels for the remaining grass. There are various types of lawn edging that you could use to form a border to contain the mulch. A shaded lawn is not the most ideal conditions for the grass, even if you have chosen a shade tolerant variety, so it is important to give as much care as possible to a lawn in shad to ensure it is given as much help as possible to thrive. Make sure you cut lawns in shade less frequently than you would a sunny lawn. 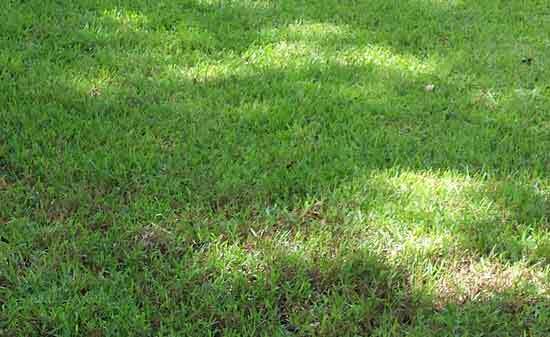 When you do cut a shaded lawn leave the grass relatively long. Cut to about 5-9cm (3-3½ in) and no lower than 6cm (2½ in). Remove the grass clippings to llow as much light as possible to get the grass. If your lawn is shaded because of trees or walls you might find the lawn gets dry as well as shaded, which is a lethal combination for grass. Water thoroughly but infrequently to encourage the trees to send their roots down deep to prevent them competing with the lawn. Lawns in shade are best fed in autumn, just prior to leaf fall. Use a high potassium (K) feed in autumn just before the leaves fall. You can also feed lawns in early spring, about a month before trees come into leaf. 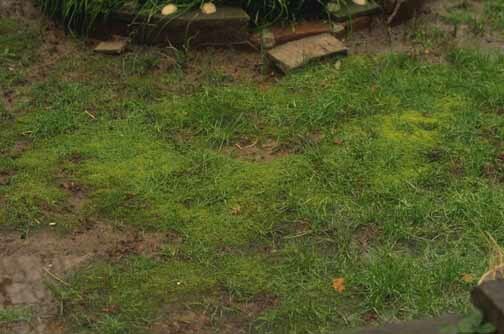 Moss tends to overcome grass in shady lawns which are moist and cool. This means that they compete for light and moisture. Remove moss by raking out, or using chemical moss control measures. Good luck with your lawn, and if you are sowing a lawn from scratch or filling in a patchy lawn, find out how to sow a lawn from seed in our project here.